Seems it’s that time of year again when we celebrate dad, so what better way to honor him than with his favorite meal? This week Isabel, owner of FamilyFoodie.com and the founder of the #SundaySupper Movement, is hosting a virtual shindig celebrating Father’s Day. For me, this was a no-brainer, as my dad loved his mother’s lamb stew, so that’s what I’m bringing. 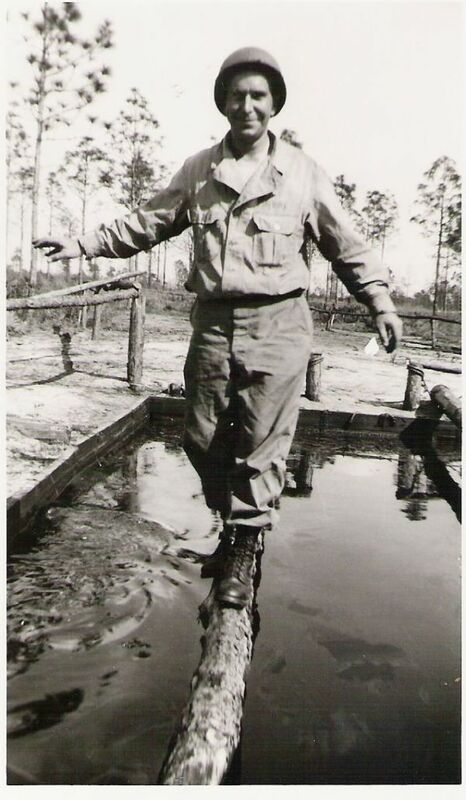 This is my dad during boot camp in Florida. He was an Army staff sergeant and was stationed in the Philippines during World War II. While he survived the war, those images of being in heavy combat haunted him for most of his life. Even though things may not have been perfect, dad made a good life for us … he was always the life of the party, he loved to barbecue, and he loved to document all of our silliness on 8mm. Oh, yah, and he loved this stew. I must say, everything about this stew is SO right. First, it comes together pretty quickly. And the flavor? It’s divine. The tomatoes, the wine, the herbs, and the juices from the lamb form a decadent gravy, perfect for sopping up with some warm French bread. 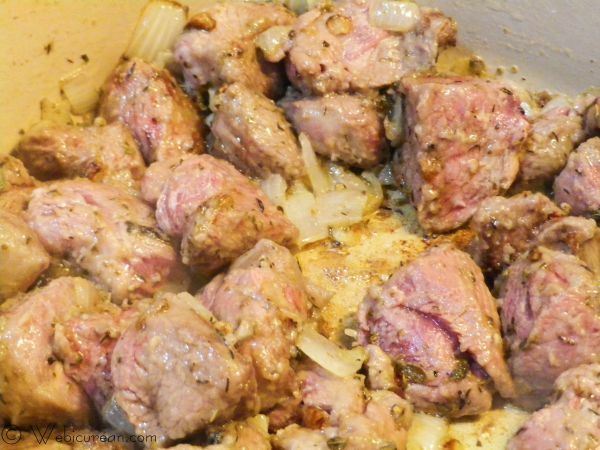 The recipe works well with either lamb or veal, and no matter which you use, the meat will be perfectly tender. Something I can never seem to manage with beef stew. Once you try this lamb stew, you may never want beef again. 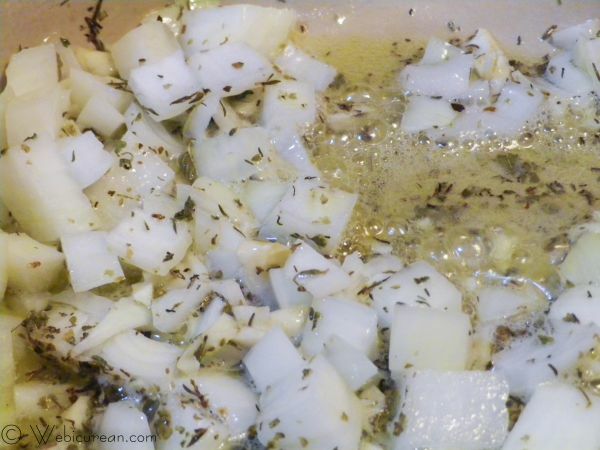 Melt the butter along with the oil in a pot, then add the onions, garlic, and herbs. SautÃ© until the onions are translucent. Dredge the lamb meat in the flour, and add to the pan, browning on all sides. Deglaze the pan with the white wine and broth. 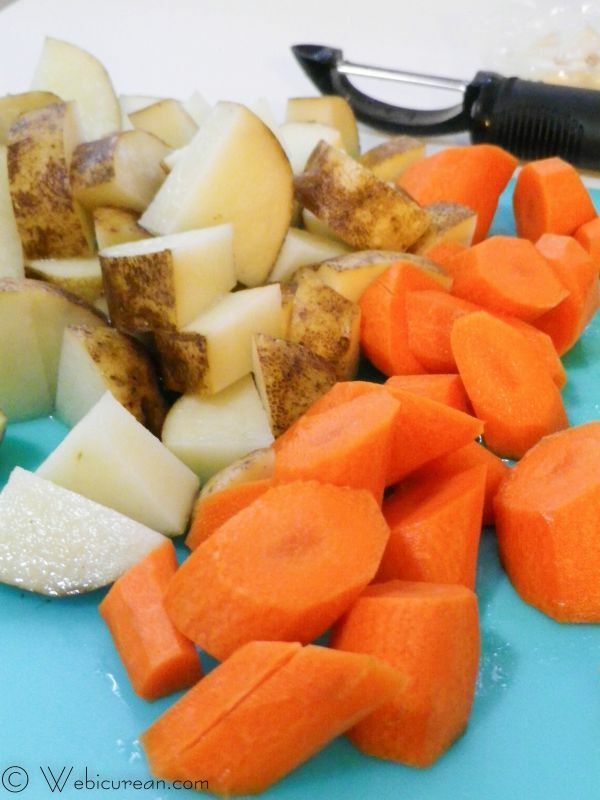 Add the potatoes, carrots, tomatoes, and tomato sauce. Bring to a boil, then reduce the heat, cover and simmer for 1 hour. Stir in the peas and olives and heat through (about 5-10 minutes). Serve with plenty of French bread. Our friends over at Palate Press recommend a pairing with something bright and fruity such as the 2011 Masut Estate Vineyard Pinot Noir. This lamb stew is simmered in tomatoes, white wine, and a combination of herbs that help form a perfectly balanced dish. In a large pot, saute onions, garlic and herbs in the butter and olive oil until onions are translucent. Meanwhile lightly coat the lamb with flour, sprinkling generously with salt and pepper. Add the meat and saute until everything starts to brown. Add the remaining ingredients except for the olives and peas. Bring to a boil, then reduce heat, and simmer covered for about an hour. Stir in the olives and peas until heated through (about 10 minutes). Great with a crusty loaf of french bread and lots of butter. Serves 6. Chewy Oat Cookies with a Banana Bread Influence byÂ What Smells So Good? Sunday Supper is not only a movement, but our contributors have become more like a family. Â Happy Fatherâ€™s Day to all the amazing families in this group! Â Without your love for family, the Sunday Supper Movement would not be what it is today. Â May you enjoy a day filled with love Around the Family Table! Come celebrate Fatherâ€™s day with the Sunday Supper Team! We would love to have you join our TwitterÂ #SundaySupperÂ chat starting at 7:00 pm EST. 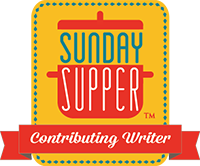 Follow theÂ #SundaySupperÂ hashtag throughout the day to see the amazing recipes. We look forward to seeing you.Â Â To join all you need to do is follow the#SundaySupperÂ hashtag and share your favorite tips and recipes.Â Be sure to check out ourÂ #SundaySupper Pinterest boardÂ for more delicious recipes and photos. Join us in Orlando this summer for our first annual Food and Wine Conference. Visit www.foodandwineconference.com. Your stew looks so delicious! I just love it!! Yum! This looks so hearty and satisfying! I love a good hearty stew, and lamb is just so incredibly flavorful. This is the ultimate comfort food. 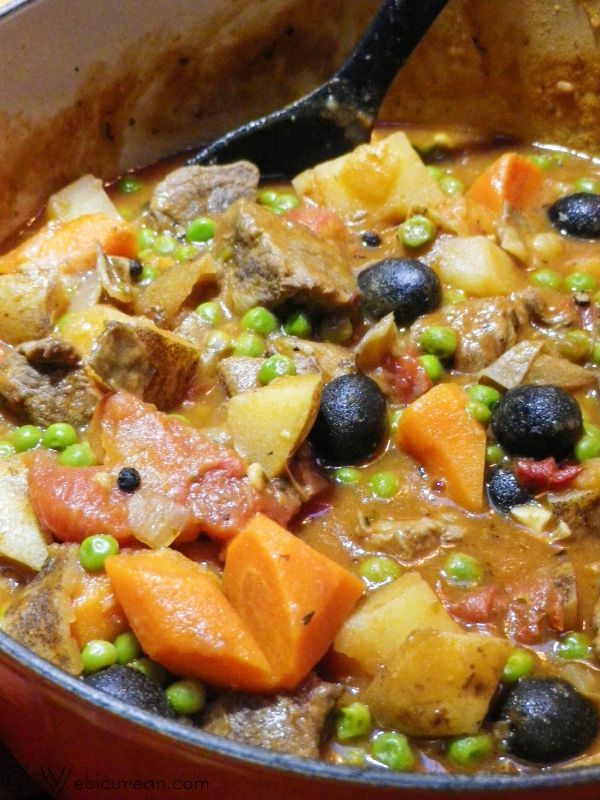 This is a perfect lamb stew! Love the photo of your Dad. Oh my what an awesome photo of your dad! You should print it and have it framed if you haven’t done so already. And speaking of awesome, what an incredible stew. I can see why your dad and anyone else would love it. Funny enough, my brother-in-law had that picture blown up poster sized many years ago, but it’s so big, I don’t know where to hang it! This stew looks amazing. I never was a huge fan of beef. Bring on the lamb! Who wouldn’t love that stew, it looks amazing!! Great post and pictures, love the one of your dad!! Oh yum! FIL is a WW2 vet as well. He spent some time in the Phillipines but was also sent around Europe and Africa. Can you imagine? Your lamb stew looks amazing and these are such a great picture of your dad. It is no mystery why he would love this stew. This looks wonderful! 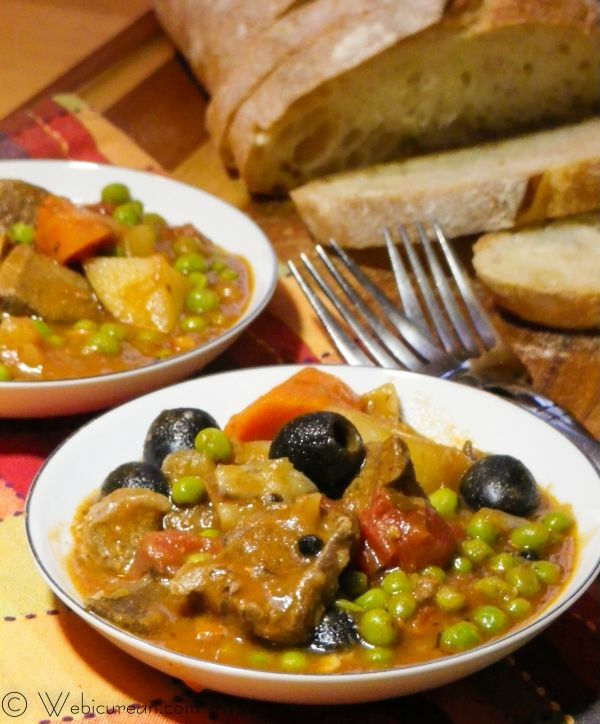 I’ve just recently started liking olives, and apparently, I’m even starting to crave them now, because I really want some of this stew! Wow – loving that photo of your dad, and I think your dish sounds so comforting and delish! Oh Man !! I just want to bite into this stew !! looks so good ! Cool picture of your dad ! I love lamb stew this sounds like I’d ask for seconds to me! Do you know I’ve never had lamb? What have I been waiting for??? Jen @JuanitasCocina recently posted..Crunch Burgers with Horseradish Mustard Sauce ~ June #PassTheCookbookClub! Cauliflower, Potato & Cheddar Pierogi for #SundaySupper | Healthy. Delicious.